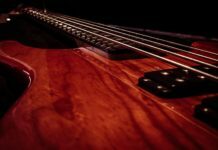 Properly recording the bass guitar and kick drum is crucial to making the low-end of a band recording sound great. Without the right microphone, the low-end of recordings will often not sound great and will thus not provide the right foundation for the rest of the band. 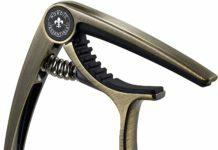 Below we have reviewed the best microphones for recording bass guitar and the best part is these mics can also be used for recording kick drum. Most recording professionals agree that miking a bass guitar amp produces the best sound quality, punch, and fullness when compared to directly recording a bass guitar. After you have picked the best bass guitar amp, it is time to find the best mic for your bass guitar. What kind of mic do you need? There are three main types of recording studio mics you can buy. While dynamic mics are best for miking bass guitar amps, you should explore the other mic types below as well to see if they produce the sound you are looking for. Dynamic microphones are the most common type of microphone used in recording. They record sound from the motion of a conductor within a magnetic field. Generally, a thin diaphragm moves in response to sound pressure which generates an electrical signal by moving the diaphragm between a coil of wire. Dynamic mics are more durable than condenser mics below, making them ideal candidates for the sometimes harsh conditions associated with band performances. These mics also tend to be the most affordable mics you can buy for recording. If you’re looking for a higher-fidelity mic, you might want to look at a condenser microphone. These microphones better capture the nuances of sound than dynamic mics which are great when you want to capture subtle melodies, but not the best when you want a heavy bass sound. While these are great mics, they also tend to be on the pricier side. These mics require an external power supply which can be from an internal battery, a dedicated power supply, or phantom power supplied by your mixer. They also require suspension so that the microphone isn’t affected by sound waves created by touch. Condenser mics are best for recording choirs, pianos, acoustic stringed instruments (including acoustic bass guitar), and certain percussion instruments such as cymbals. Ribbon mics were the first directional microphones that could be produced commercially. They were extremely popular during the heyday of radio due to their excellent voice recording abilities. Instead of responding to the sound pressure level (SPL) as most modern mics do, ribbon mics respond to the velocity of air molecules moving a small element suspended in a strong magnetic field. Ribbon mics tend to be extremely fragile because of the thin ribbon inside that vibrates to vary voltage. They also tend to be the most expensive mics available. The Shur SM57 is one of the most popular microphones around and it has been a best-selling mic ever since it was first released in 1965. Shortly after it was released, it became the go-to mic for bass, guitars, vocals, horns, drums, and more. In fact, many US Presidents, from Lyndon Johnson to Barak Obama, have used the Shure SM57 as their podium lectern mic of choice. What makes this mic so popular? First of all, it is a dynamic mic and as we explained in our overview of dynamic mics above, these are great general mics and can withstand higher sound levels than other types of mics. This also makes them very affordable. 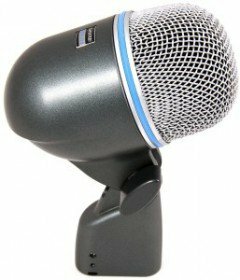 You can easily get the SM57 for less than $100. Second, the SM57 is well-made and very durable so it can withstand years of use and abuse. Finally, this mic sounds amazing on bass guitar amps. If you’re looking for a great multipurpose microphone, look no further than the Shure SM57. A great looking mic that also has phenomenal sound. This mic is best for any sort of bass instrument (drums, guitar, tuba, etc) but works best with bass guitars and bass guitar amps. The mic perfectly captures the punch of bass guitars while not clipping any of the tones of the bass guitar. 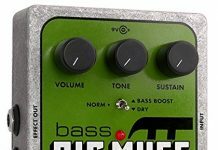 Its large diaphragm capsule enhances the bass response so your bass always sounds amazing. The mic comes with a built-in stand so you don’t need to buy one separately and it also includes a convenient pouch for transport. This is a very straightforward mic. 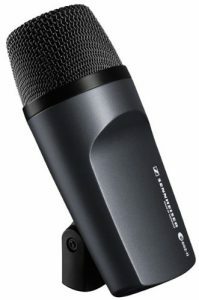 Another Shure mic, the Beta52A is best for live performances, but can certainly be used in studio. 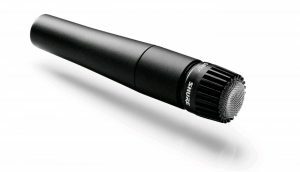 It is very rugged and durable, making it a great mic that can be tossed around on-stage. The Beta52A features a rare supercardioid polar pattern which gives it increased sound isolation for live-recordings, increased proximity effect, and more tonal control. If you’re looking for a versatile microphone and are willing to shell out a little more cash (nearly $200), this mic is a great addition to your recording setup. 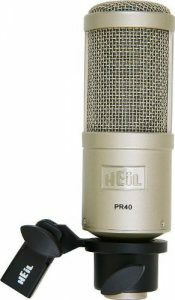 Known as the “podcaster’s mic of choice,” the Heil PR40 is known for its deep bass response. It is a great studio quality mic that is versatile enough to handle most recording situations. Capable of handling the high SPLs that more bass rigs generate, this dynamic mic has an unusually wide frequency response. It’s well-known for its depth, richness, and resonance. Adding to its list of uses, this mic has been used in movies. In fact, it was strapped to live military cannons to capture sounds for the movie “‘Letters from Iwo Jima” which won an Oscar for its sound. The mic comes in three different colors: gold plate, champagne, and chrome plate. The Audix D6 delivers great sound quality, especially on the low end, which makes it great for recording bass guitars and kick basses. The dynamic microphone is specifically designed to capture extended low frequencies. It is also omnidirectional, meaning it record the same quality of sound regardless of where it is placed. A VLM (very low mass) diaphragm built into this mic provides an excellent transient response. This also produces a unique sound which often leads to mixed reviews about this mic. You can’t go wrong with any of the recording microphones above. The best mic will depend on your specific recording situation including whether you are recording a live performance or are in a studio, what instruments you are recording, and what kind of sound you are looking for. We think the Shure SM57 is the best all-around mic on this list, but you may fall in love with the sound of another mic. Feel free to try as many as you need.